What is networking and how is it done? Very simply, networking is the process of using people connections to gain information about careers and jobs; it is valuable both in finding out about job openings and in securing a job. Some studies show that as many as 70% of jobs are obtained through networking. Networking is one of the most important career skills a law student or alumni can develop because many jobs are never posted online and many opportunities develop through relationships. The more people that know you and have your resume, the more job opportunities you will have. Therefore, it's important to put aside any concerns you have about networking, and jump right in. One of the major concerns expressed by job seekers is that they will be perceived as being "pushy" when reaching out to others for information. While some individuals are "pushy" when they network, you do not have to use this approach. If this is a concern for you, think of networking as a two way street. You are interested in ultimately finding a job through meeting people, but you also have a lot to give others and a lot to learn about the many careers available in the legal profession. You are or will soon become an attorney, and as an attorney, no matter where you go in your career you will be a valuable contact for others. Networking is a skill that you will need for the rest of your professional life, as you will want to continue to meet people and move forward in your career. In addition, you may need networking skills to generate business through relationships with clients for a firm. Also remember that many people enjoy talking about the work that they do and are flattered to be asked for an "informational interview." An informational interview involves sitting down with someone, often in their office, or over coffee or lunch, and asking them questions about their career. Just as your opinion about Chicago-Kent may be solicited by a prospective student, practitioners expect questions from current law students about their practice area, employer, or other issues related to the field of law. Do not be discouraged if you reach out to someone new, particularly over email, and they do not get back to you. Lawyers lead busy lives and there are many reasons that you may not have heard back from someone. Below are additional strategies for making new connections and seeking informational interviews. Once you develop your networking skills, networking will become a regular and rewarding part of your professional career. People from your religious community, your condo association, community groups, volunteer groups, sports clubs, etc. Now that you have a list, how do you begin to reach out? If you are a law student, you may be looking for a law clerk position for the summer or school year. Contact the people on your list with an update about law school and let them know that you are starting to think about job opportunities for the summer or school year and what you might do with your career. Focus in on the individuals who have careers that most closely match your interests and try to meet with those individuals in person. While it takes more time, a personal note is generally more beneficial than a mass e-mail directed toward many individuals. It is important not to set your expectations too high when networking. For this reason, networking is best done throughout every semester of law school and not as a last resort when you are desperately seeking a job. Every attorney you contact, whether practicing or not, and whether they are in a practice area that interests you or not, can provide you with information and ideas on techniques that helped them land their present and past jobs. In addition, every attorney you meet with went to law school and they know other attorneys who may work in practice areas that interest you. Therefore, it is important to ask your contacts, "Who else do you suggest I speak with?" so that you can expand your list of contacts as you progress in your job search. Initially, some individual contacts may provide you only with information when you meet them, but over time, you may develop a closer relationship and they may refer your resume to someone when they hear of a future opportunity that matches your interests. Do not burn bridges with any individual, always be courteous and follow through on any appointments you make. The legal community is remarkably small, particularly within niche practice areas; therefore, every relationship is important. How do I expand my networking to include people I do not know? Contact your undergraduate career services office and request the names and contact information for graduates who are practicing attorneys, regardless of where they went to law school. You can specify your request according to geographic area and if possible, by practice area. If you are interested in a non-legal career, request information about graduates in the field(s) you are interested in pursuing. a) Speaker Programs and Receptions at Chicago-Kent. It is easier to contact an alumni you have met, even if it is only briefly to collect a business card at a reception or speaker panel event, than it is to reach out to someone you have not had previous contact with. Attend the many speaker programs conducted by student groups, the career services office and the office of alumni relationships throughout the year and talk with the speakers afterwards. Join a student organization and volunteer to contact speakers for a program. All events are listed in the Record. b) Chicago-Kent is "Linked In." Linked In is a professional networking site that any user can join, create a personal profile and link to professionals they know. All students, faculty, alumni, and staff are invited to join the official Chicago-Kent group on the networking site, LinkedIn. If you have a LinkedIn account, please click here to request membership. Questions? Contact alums@kentlaw.iit.edu. c) Martindale.com is an extremely useful way to find alumni in practice areas that interest you. When you visit the www.martindale.com website, click on the "advanced search" feature on the left side of the page. 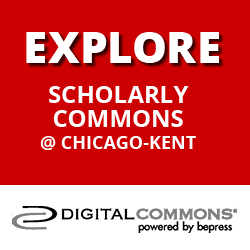 The "advanced search" allows you to search for Chicago-Kent alumni in a variety of practice areas at locations throughout the country. If you speak another language, the "language skills" feature can help you find alumni and identify firms that work with clients who speak that language. It is important to understand that not all lawyers are listed on Martindale. Lawyers and firms pay to be included in this search engine, therefore any list you receive will not be comprehensive. d) Another way to develop your list of alumni is to utilize the Chicago Area Law Firm List a/k/a the "4 or More List" available in Symplicity. The list contains the names, contact information and practice areas of firms with 4 or more attorneys in the Chicago-area and is searchable by practice area and firm size. To use the list to locate alumni, do a search of firms in the practice areas that interest you. 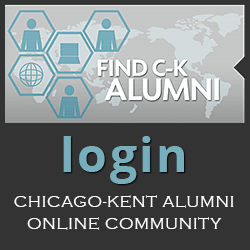 Once you've created your list of firms, visit firm websites to determine which firms are of the most interest and search attorney profiles at the individual firms to identify Chicago-Kent alumni you would like to reach out to. Bar Associations are one of the best ways to network and should be utilized extensively throughout your legal career to meet new people and stay on top of the latest practice developments in your area of law. Many bar associations host social events, seminars and other occasions where you can meet practicing attorneys. For example, the Chicago Bar Association has practice groups in practically every area of law that meet monthly throughout the year at noon to discuss the latest legal developments in those areas. These meetings are severely underutilized by students, who can join the Bar Association with a student membership and attend meetings. 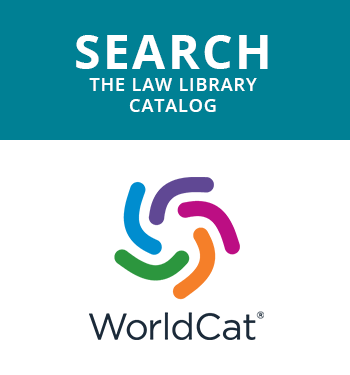 Additional local bar associations can be found here. In addition to Bar Associations, join an organization which focuses on your area of interest or advocates for a particular cause you feel strongly about. Volunteer to serve on a committee or staff an event so that you can meet as many people as possible. Remember, with both professional organizations and bar associations, it is most helpful to be an active member so that your name is recognizable and you feel more comfortable discussing issues involving the organization. A great way to meet other lawyers and gain new legal skills is by participating in pro bono activities. In Illinois you can find pro bono volunteer opportunities at www.illinoisprobono.org. When you go to the website, click on the "volunteer search," tab at the top. Many legal aid organizations are seeking law students to assist clients. If you are an attorney, legal aid organizations provide training and malpractice insurance so that you can address client needs in an area of law that may be unfamiliar to you. How do I reach out to someone I do not know for an informational interview? NOTE: For detailed information on informational interviews, see the "Informational Interviews" page. It is more difficult, but you can network with people you don't know. When reaching out to an alumni, or any individual you do not know, it is important to introduce yourself, providing them with relevant information that will increase the chances that they may be interested in speaking with you. Dear Mr./Ms. Smith, I am currently a 3L law student at Chicago-Kent and I am interested in pursuing a litigation career, as you have done. As a student at Chicago-Kent I've clerked for a litigation law firm and participated in the Litigation & Alternative Dispute Certificate program, through which I've worked in several clinics at the law school. I would like to speak with you more about your work at (insert firm here), as I am interested in pursuing a career with a mid-sized firm and would like to understand more about the work of the firm. Would you be open to a conversation over lunch or coffee? I am flexible and would be happy to work with you to come up with an agreeable time. I've attached my resume for your reference. It is important to not be too pushy in the request for a meeting. Do not include a formal cover letter, it is better to include a brief introduction of yourself over email. Do attach your resume to provide the contact with some additional information about yourself, but be sure to say, "I've attached my resume for your reference." Be sure that your resume and message to the employer are free of all spelling and grammatical errors, as a mistake of this nature can be an immediate turn-off. How do I reach out to someone I have not communicated with in awhile to re-establish contact? Hi Paul. Just wanted to let you know that I've started my last year at Chicago-Kent College of Law. I've continued to work on litigation issues and would really like to start my career at a small or mid-sized litigation firm. I'm focusing my search on the greater Chicago region. Please keep me in mind if you hear of any job openings. Now that I have a meeting set up, what do I say? When you meet with an alum for an "informational interview" prepare a list of questions to ask ahead of time. You should have your resume on hand, just in case they request a copy. The informational interview is a place to make a potential ally in your job search and build a relationship; you do not want to alienate an alum by asking directly for a job. Many people like to discuss their work, but attorneys are also busy. If you do not receive a response to your email in a week, you may email again or follow-up with a call, but if you don't hear anything you should move on or find a different strategy to meet that person. What was your experience like at Chicago-Kent? What did you do in law school that helped you obtain the position you are in today? Are there courses that you would recommend that would help me seek a career in...? I'm considering a "Certificate" in...do you think it is useful to specialize in a practice area? Why did you decide to work for....? What do you like best about the firm/agency? What sets your firm/agency apart from others of comparable size and practice types? What types of matters or cases are you currently working on? What's a typical day for you? What is the most interesting/challenging matter you've worked on during the past year? Did you always plan to specialize in...or did you develop an interest in that area after practicing a few years? What do you think are the challenges of being a lawyer in today's business climate (or political climate)? What do you think are the rewards/satisfactions of practicing law? What are the pressures or stresses that lawyer's face in today's practice? Are there other attorneys you suggest I speak with? In addition to asking questions, pay special attention to your demeanor. Remember to use good eye contact and active listening skills. Practice your handshake, so that you are able to offer one that is strong but not painful. Utilize all of the rules of etiquette to make sure that you are presenting yourself in the best light possible. Recognize that you will not hit it off with every individual you meet. Popularity is not the issue, relationships are. Find individuals who share common interests with you and build those relationships over time. Don't forget to thank the people who have helped you. If you talk on the phone, a short thank you email is sufficient. However, if someone meets with you in person, be sure to send a handwritten note. Follow-up is a crucial part of networking. If you meet someone at a social event or seminar and pick up their business card, it doesn't hurt to write an email note within 24 hours of meeting indicating the pleasure of meeting them. That type of follow-up makes future encounters or phone calls much easier to initiate. After meeting, you may wish to contact people by phone or by letter, possibly suggesting another meeting. Remind the person of who you are, and where you met. When you get someone on the phone, make sure that they have the time to talk with you. A simple question such as, "Are you available to talk for a few minutes?" can go a long way. Do not push yourself on people who are giving signals of pulling away. While you want to be assertive, you don't want to cross the line and become pushy. In the job searching arena, you never want to burn any bridges! After the informational interview, think about creative ways to stay in touch with this contact. Set up Google news, Lexis and Westlaw alerts for the contact's name or the firm/agency/organization where they work, and check Law360 for similar news. When you learn of a personal or firm accomplishment through these sources, send a congratulatory email. Monitor legal publications, and send interesting articles to your contacts, or alert them to upcoming CLE classes they might find useful. You can also update them with regard to your status in school, academic accomplishments, and other life events. How frequently you contact each person will depend on the relationship that develops as you continue to reach out. Some attorneys will respond more than others, but as everyone is a potential resource, don't neglect any contacts on your list. Organizing the information in this manner will allow you to monitor how frequently you are in touch with your contacts and keep up with them without allowing too much time to pass. Keep the business cards you collect in a Rolodex or other filing system so that you have access to them in the future. You may choose to file the cards by event, if you collect many cards at one specific event. Write notes about the person, your meeting, etc. for reference when you talk with them again. Always carry business cards so that you may distribute them to people with whom you've enjoyed talking. There are a number of free online resources that allow you to print your own business cards. Remember that networking is not a science and therefore does not offer an exact answer or immediate response. It is the process of relationship building and in the words of one practitioner, "planting seeds." You may not reap the benefits of your efforts until long after the initial meeting. However, maintaining relationships with your contacts can lead to future career opportunities, business or referral sources and increasing your name recognition amongst the "players" in the legal community. This is of course in addition to the immediate rewards of building your knowledge and contact base. Networking is an important life-long skill that will result in many professional rewards. As you move forward in your career, continue to set networking goals for yourself depending on your needs. While seeking a job, you may strive to make a new contact every week; to stay in the habit of networking once you have found a job, you may strive to make a new contact monthly.